I hope someone can help me with this very problem. Allthough I tought I did my homework and tried to make sure the remote I'm going for is supported by JP1 software I'm now running into a lot of trouble. I'm using a simple FTDI TTL-232R-3V3-WE USB to TTL cable to connect to the remote. do a raw download as follows. Close RMIR, re-open it and click on "Raw download"
on the Remote menu. Click the Download button on the window that then opens. When the download finishes, click Save. Accept the default filename that is offered. Then post the resulting file in the JP1 Softwareforum for the experts to examine. 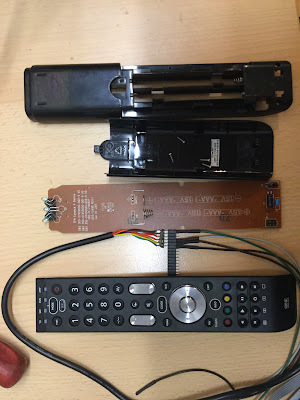 To get you as much information as possible I took the remote apart, below you can find pictures from all stickers and lables I found on the device. Furthermore I hooked up my USBee DX Logic Analyzer to the TTL communication lines and captured a real raw copy of the data send back and forth between PC and RC. I hope someone can help me to get this remote running. If you need any further information please let me know, I'll try to get what's needed!! It seems likely that your remote has a revised version of the firmware for the URC-7140 that we have not seen before. 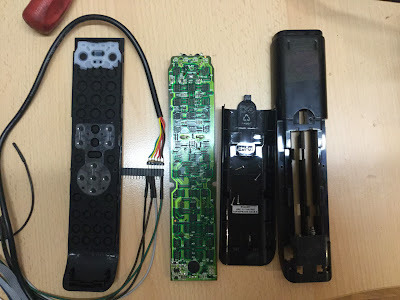 We have come across other remotes with a 6-digit signature that have had firmware revisions that have been given a new signature. So here is something you can try. The signature of the remote is the numeric part that begins the name of the RDF file. As I think you have found out, there is no RDF file whose name begins 3511. The full signature for your remote will be six digits, like the 326605 in the file name of the existing RDF for the URC-7140. The 5th digit is almost certainly 0. You need to find the 6th digit. If you then replace the 326605 in the RDF file name with the 6-digit signature of your remote, it will at least find the RDF. If this is a firmware revision, there is a good chance that the same RDF will work. You have two choices to find the 6th digit. The simplest is to try 1 to 9 (and possibly 0) in turn in the file name and see which one, if any, is recognised. The other is to read the signature from the remote. Here is a method that may work. Again, without having the remote, I can't be sure, but worth a try. Press and hold Setup for about 3 seconds until the LED flashes twice. Enter 983 with the digit keys. The LED will flash twice on the final digit. Press in turn the digits 1 to 5 and count the LED flashes each time. The number of flashes gives you the first four digits and the sixth one (as I said above, the fifth one should be 0). I was able to get the signature just by looking for ascii codes for 3511 in the csv files from the logic analyzer (the raw download one). As you can see the signature is 351101. Is there anything else I could do?? thanks for your help so far!! I was able to get the signature just by looking for ascii codes for 3511 in the csv files from the login analyzer (the raw download one). Yes, do what the message says. Create a raw download file and post it for us to look at. Have you checked your private messages? This will then load, using the RDF with signature 326605. As you see, the first block is just the signature in ASCII, so you can change this to the signature of your remote and use your modified RDF if you like. Probably that will allow you to download from the remote. However, I recommend against uploading until we get more info. The revised firmware probably has different setup codes, and perhaps executors or number tables. your advice worked, download now works!! And the data displayed so far appears to be consistent as well. Please let me know when you think it will be safe to upload configs to this remote. The OneForAll site suggests that the 7140 has been made in versions 7140, 7140R01 and 7140R02. Please look at the label inside the battery compartment to see whether your remote is R01 or R02. Posted: Sun Apr 12, 2015 1:58 pm Post subject: me 2! Yes, it works with our software. Make sure that you use a recent version of RMIR 2.03, so that you get the RDF file.